Taken on 13th October 2006 from SIGMA's observing site, using a guided EOS 300D camera with 150mm telephoto lens. 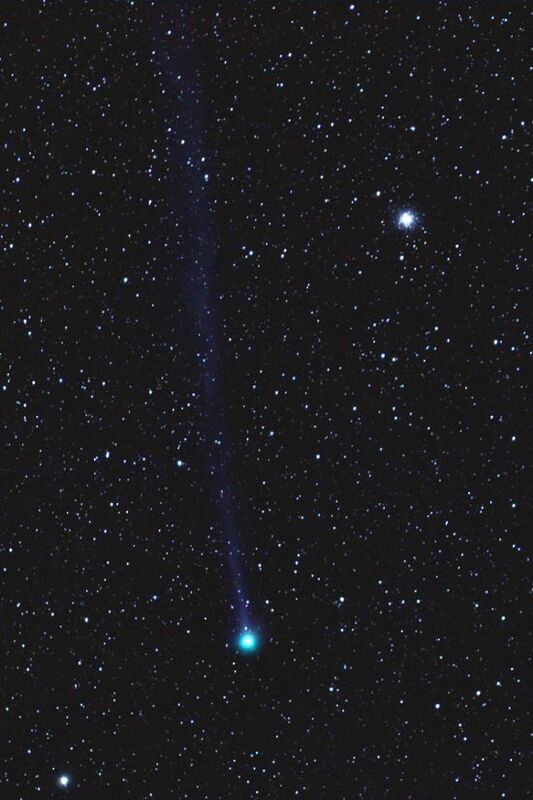 Alan found that the constellation of Lyra fitted just nicely in the field of view of the lens! 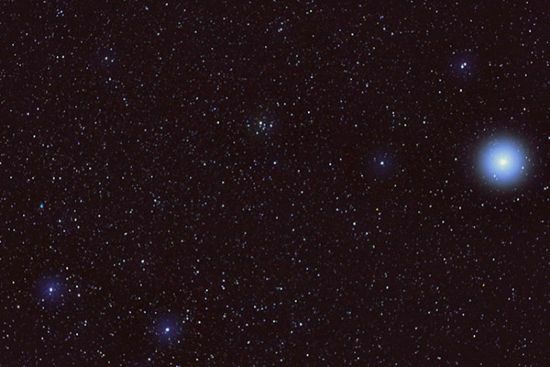 The sharp-eyed amongst you may spot the tiny blue-green disc of the Ring Nebula, M57, between the two bottom stars of the constellation, Gamma and Beta Lyr. Taken from the SIGMA observing site on Saaturday 28th October. Equipment used was a guided Canon EOS 300D with a 150mm, f2.8 telephoto lens. Six 3-minute frames were stacked to produce the final image. Note the globular cluster M13 near the top of the image too! 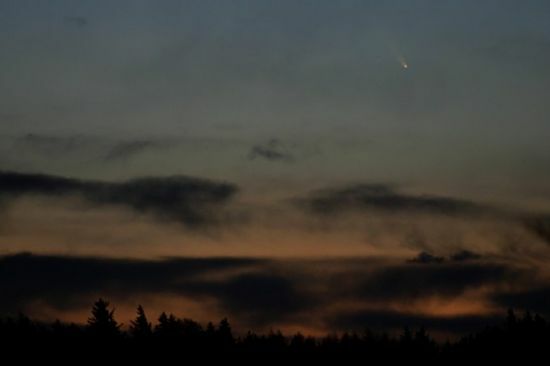 This was Alan's last sighting of Comet McNaught. The image was taken on 9 January 2007 at 07:54 UT with a tripod-mounted EOS 300D and 75-300mm lens (set to 260mm). Exposure was 1/5 Second at f/5.6, ISO-400. The above image of B142/B143 (Barnard's E) in Aquila, which was taken on 22nd August 2007, is actually a stack of 3 x 150 Second exposures. Although the sky transparency was good, the seeing wasn't particularly brilliant and so a lot of processing had to be done on the individual images as well as on the final stacked image. Equipment used: Canon EOS 300D, Sigma EX 150 mm APO lens, 1.4 x APO teleconverter, Vixen GP photo guider. Exposure details: 3 x 150 Seconds @ F/5, ISO-800. 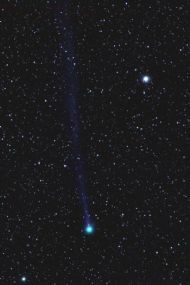 Image of Comet 17P/Holmes taken on 28th October. The image is derived from a stack of 7 x 15 Second exposures using a Canon PowerShot S45 and Sky-Watcher Pro-Series ED2 100 mm refractor. After 2 weeks of high pressure, the barometer suddenly dropped on Wednesday 20th February and the forecast for the eclipse on the 21st was not good. By some minor miracle the clouds cleared and the wind dropped for the start of the event. I saw about 10 minutes of totality before the sky completely clouded over. This image was taken at 3:04 a.m.
Equipment used: Sky-Watcher ED80, HEQ5 mount, Canon EOS 300D at prime focus. Exposure details: 5 Seconds @ f/7.5, ISO-400. 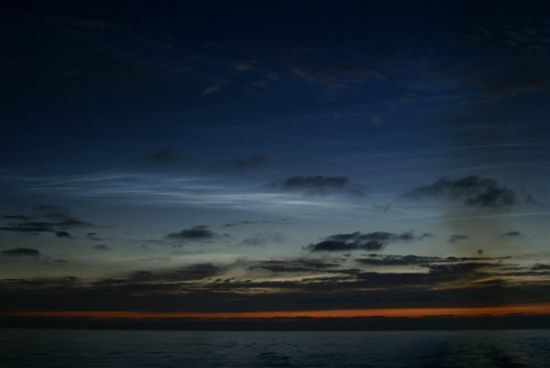 This NLC display was visible from the stern of the MS Norwegian Jade, on route from Stavanger to Southampton. 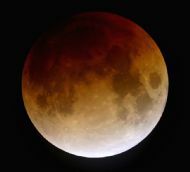 The accompanying image was taken with at 00:58 UT (approx.) with a Canon EOS 300D and 28-80 mm lens. Exposure details: 0.8 Sec @ f/3.5, ISO-400. 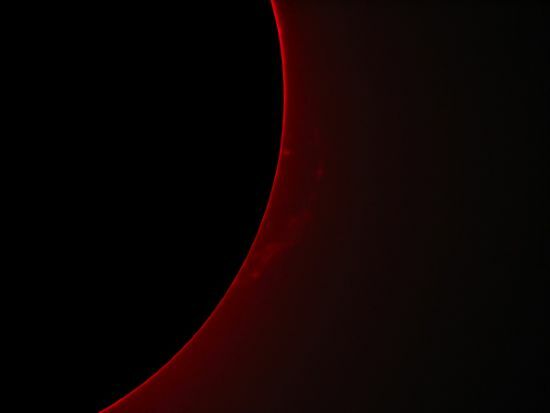 Faint arching prominence seen earlier today through PST Hydrogen alpha telescope. The image is a stack of 10 x 1/20th Second exposures taken with a Canon PowerShot S45. Alan took advantage of the clear, frosty nights at the end of December to image the Alnitak region of Orion. 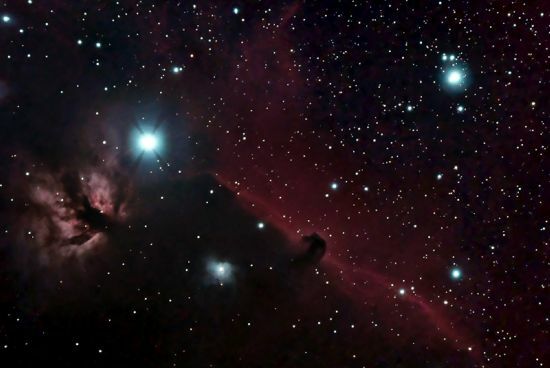 The final image reveals a smorgasbord of nebulae: Barnard 33, the Horshead Nebula, is silhouetted against the bright emission nebula IC 434; Next to 2nd-magnitude Alnitak is the emission-type Flame Nebula, NGC 2024, with its dark dust lanes; Close to the Horsehead is NGC 2023, an emission and reflection nebula. 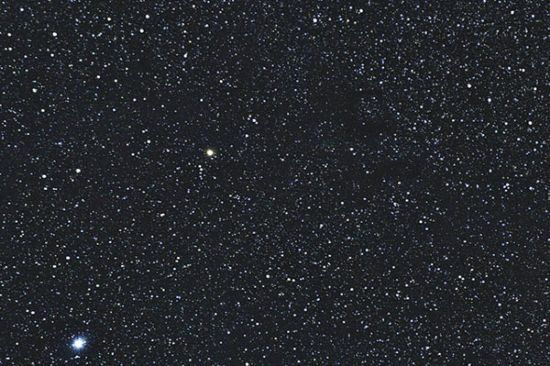 The multiple star Sigma Orionis is at the top-right corner of the image. Imaging and guiding equipment: Sky-Watcher Evostar-Pro 80ED (f/7.5), Sky-Watcher Evostar-Pro 100ED (f/9), HEQ5 mount, Canon EOS 300D at prime focus, Astronomik CLS filter, StarShoot Autoguider, PHD guiding software. Exposure details: The sub-frames were taken between 28 and 31 December 2008, giving a total exposure time of 2.5 hours. The average temperature during these sessions was -8 degrees Celsius. Processing time was in excess of 12 hours. Photoshop (with Noel Carboni's Astronomy Actions) and Neat Image were used to process the subs. 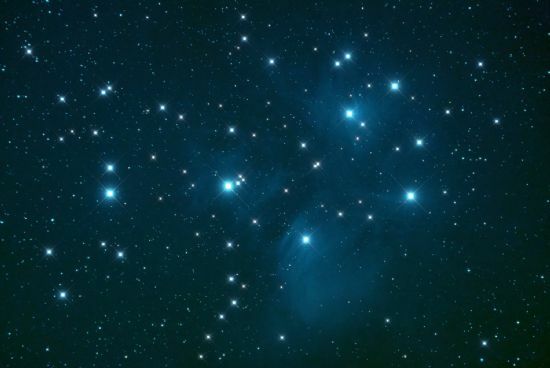 This image of The Pleiades was taken from Elgin on January 9. Thin high level cloud caused me some processing difficulties though. The 50 minutes worth of data were processed using Photoshop 7 (including Noel Carboni's astronomy actions and StarSpike Pro plug-in) and Neat Image. Equipment used: Sky-Watcher ED80, HEQ5 mount, Canon EOS 40D at prime focus, Astronomik CLS filter. Exposure details: 5 x 10 minutes @ f/7.5, ISO-800. Guiding equipment: Sky-Watcher ED100, StarShoot Autoguider. 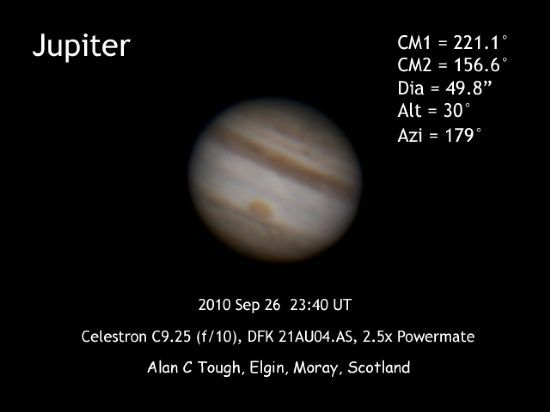 This is my second go at imaging Jupiter with a DFK astronomical video camera and 9.25" SCT. The seeing was good enough to let me use a 2.5x Powermate, but I'm still hoping for more stable skies before the winter sets in. With the 'loss' of the South Equatorial Belt, the Great Red Spot certainly stands out. However, the 'shadow' of the SEB can still be seen. I was also pleased to pick up the North Temperate Belt as well as some dark streaks in the South Polar Region. 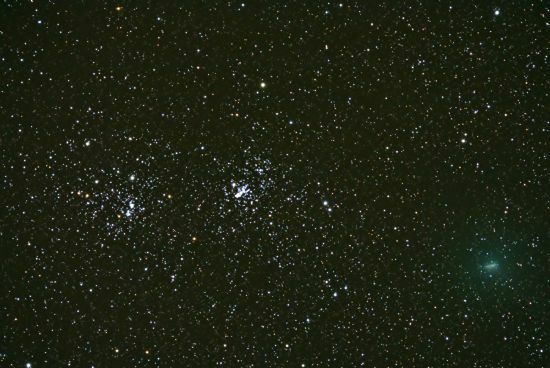 Comet 103P Hartley and the Double Cluster in Perseus. 10 sub-frames were taken between 23:46 and 00:10 UT on 2010 October 07-08. The data were processed using Photoshop 7, Noel Carboni's astronomy actions and Neat Image. Equipment used: Sky-Watcher ED80, HEQ5 mount, Canon EOS 40D at prime focus, 0.85x Reducer-Corrector. Exposure details: 10 x 90 Seconds @ f/7.5, ISO-800. Guiding equipment: Sky-Watcher ED100, StarShoot Autoguider.